I had never heard The Last Post played on a solo Violin. including both of her Great Grandfather’s. Sadly, neither of them made it home. To those who served then and to those who serve now, thank you. Here is her rendition of The Last Post. It was a busy day for me and by evening I was/am tired and didn’t add anything to my NaNo novel. For PiBoIdMo I came up with a cute character name so that makes idea #17 for day 11. Now I’m all mixed up because today was a day off work for my husband, and we were at the Remembrance Day service followed by the Veterans dinner. It doesn’t feel like Monday to me. Here ends today’s NaBloPoMo post. Now I must sign off, get some sleep, and tackle my writing tomorrow. Today was a busy day for me. I had much to do at Dad’s before I came home for the week, but I also spent lots of time just with him. I didn’t get anything at all written on my NaNo novel, but I got a fun idea for PiBoIdMo before I was even fully awake this morning. That gives me idea #16 for Day 10. 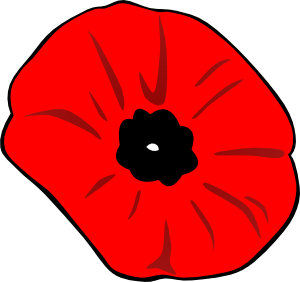 Tomorrow is Remembrance Day here in Canada, Veterans Day in the USA. Since Dad is a WWII veteran we will be attending the special service in the morning. It’s not foremost in Dad’s thinking this year, but we are seeing to it that he gets there since he would not like to miss it. Next year may be a totally different scenario. Following the service ten of our family will be going to the veterans’ dinner with Dad. 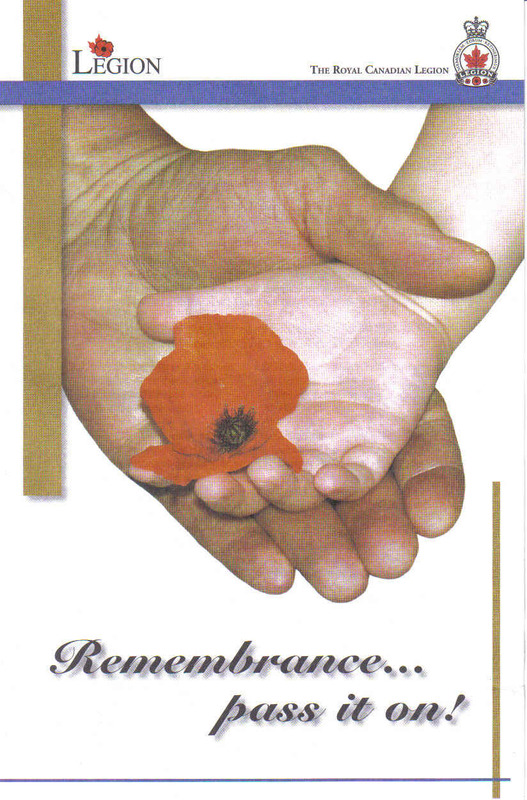 REMEMBER AND HONOUR OUR VETERANS ON NOVEMBER 11. THEIR SACRIFICE IS ONE WE CAN NEVER FULLY UNDERSTAND UNLESS WE’VE BEEN THERE. GET OUT TO A SERVICE AND REALLY OBSERVE AND LISTEN. Have you ever talked with a veteran about the war, and their experiences they’re willing to discuss? Lately, I have been finding it hard to write. If you have been following my progress during NaNoWriMo you will have noticed there is not much moving forward the past few days. I am so far behind now there is little hope for me to end the challenge with a high word count. I’m even wondering if I will finish this novel no matter how many words it takes to get there. For some people, when things are going wrong in their lives, or they are just having a down time, they write. It helps them through it. But for me … I can’t seem to think that way. The creativity gets put on hold by whatever is troubling me. I seem to fall victim to my emotions, and that’s not a good thing. Remembrance Day is a special day for this family. Our dad is a WWII veteran and we are very proud of him, especially as he was one of the young Canadian soldiers who bravely liberated the Netherlands. For years, with Dad we have attended the ceremonies and the Veterans’ dinner following the special service. This year things got a bit confused and it was difficult for awhile – my week “on duty” so it was more upsetting for me. It got straightened out but left me with a troubled heart. That affected everything since I just can’t seem to separate myself from it all even when I get away for my week at home. I think if I were good at writing through things, I would have had a lot more done on my novel by now! Last Thursday was my birthday. I won’t say which birthday, I’ll just leave that for you to guess if you want to. I’d been talking to God, telling Him (as if He didn’t already know, but I had to admit it) that I need help. I need help to get through this. The day before my birthday two friends called me, two friends totally apart from one another and whom I hadn’t talked with in awhile. Neither knew my of increased stress, both conversations were ministering to my need. The next morning, November 16, a really interesting thing happened when I woke before my feet even hit the floor. First, by way of explanation — There is someone who has a website or blog who chooses a word for herself at the beginning of each year, and challenges others to do the same. That word – individual to each person – is to be their word by which to live all that year. (I’m sorry I don’t recall who that person is, but if you know please remind me in a comment.) I had tried to come up with a word for myself, but nothing came to me. What is fascinating to me is that as I was waking on the morning of my birthday .. there it was! My word. GRATEFUL. Now, let me tell you, that word makes a difference. The trick is to remind myself of it in the midst of disappointment, worry creeping in, feelings of inadequacy, frustration, sadness, depression raising its ugly head, anger over things beyond my control … GRATEFUL chases it all away! Our Canadian Thanksgiving was October 8, USA’s Thanksgiving is coming up on November 22, so it seems quite fitting to have this word now. Try it out and see what it does for you. Do life’s struggles set your writing free? or does writing free you during times of stress? If you write when life hits you hard, how do you do it? Do you have a word to live by for this year? Day 11 (Thursday) of NaNoWriMo I was able to eke out 1415 words, which took my total up to 14131. Because my word count has been low each day this week, I am behind by 4206 words. Since I am writing this post after midnight (now into Friday) my stats tell me “At this rate you will finish on Dec 12.” Judging by that, I have a lot of writing to do to catch up. The first three days of this writing challenge I was ahead but that didn’t last long. I’m up to 29% completion, though, which is encouraging. I’m still finding that my characters are very chatty, especially my MC (main character) and her best friend. Yes they are girls, but girls are usually more expressive and use more words, are more creative in thought. So, I get girls as my main characters and much of my story is dialogue. I say “I get” because I didn’t choose them, they chose me. Any writers out there relating to this? Today (Thursday) was Remembrance Day. Here in Nova Scotia we give honour to our war Veterans, but that same respect is not practiced in every province. That is sad and unfortunate. If our Canadian soldiers in World War II had not put forth the effort and sacrifice that they did, this world would be a lot different now as Hitler was winning the war. But, I won’t get on a tirade about that now. 😉 I’m just proud of my dad and very touched by what he and thousands of others chose to do for this country’s freedom. Have you really thought about how different a world we could be living in? And my question for you writers is .. do you create your characters or do they choose you? For Day 10 (Wednesday) of NaNoWriMo I wrote 645 words. My characters are leading the story, I’m just writing it out. Interesting how that is happening. I’m about 4000 words behind where I should be, though, not counting Thursday when this update will actually be posted. But I’m not stressing over it, just sayin’. The ideas were flowing for PiBoIdMo today, though. I got four ideas, one in particular I really like and which was inspired by Remembrance Day and my dad – a WWII Veteran. It was a very cool and windy day, not a day that encouraged me to leave my warm house, but tonight I went to the Alzheimer’s support group meeting that is held once a month. This is the second one I attended for the time of sharing and listening to others facing that dread disease in someone they love. I am very thankful to the Lord for His strength and encouragement. Anything you are facing that is relieved by writing?